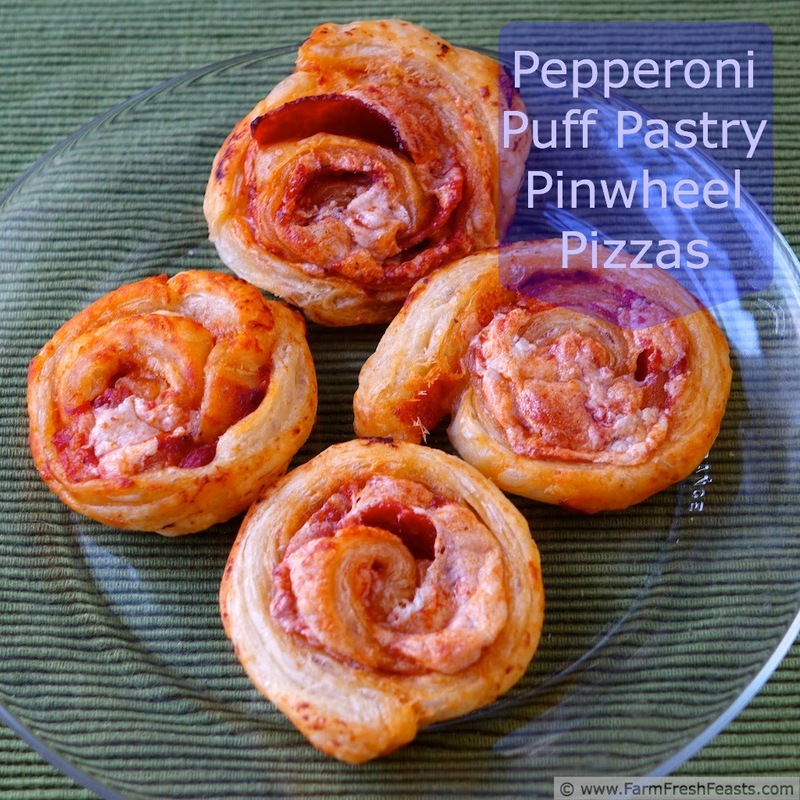 Pepperoni pizza flavor inexpertly rolled into individual pinwheel pizzas. Question: When is a pizza not an entree but instead an appetizer? Answer: When the pizza is little, cute, and can be consumed in a couple of bites. Bonus points for alliteration. I had the puff pastry pizza idea for a while before I could execute it. Luckily I picked up 2 boxes of puff pastry when I hit the outlet mall, so I had plenty of material to practice play with, because this was tricky for me to do. I may make pizza crust look easy in my Pizza Primer, but you'll find some puff pastry outtakes on my FB page. 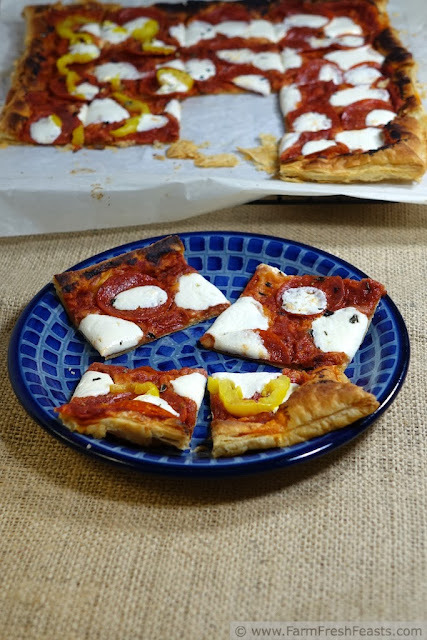 My first try [using fresh mozzarella and RTFM for baking instructions] was tasty but messy. I baked the puff pastry for 10 minutes until it blew up like a throw pillow, then whacked it reasonably flat with my pizza peel [you may incorrectly assume I'm exaggerating here] and attempted to spread sauce on the flaking crust, added the toppings, and returned to the oven. By the time the cheese was starting to melt the crust was starting to burn. I went back to the drawing board. Disregarding the published instructions and going rogue, I debated just topping the rolled-out puff pastry dough and baking it, but in the end I decided to roll it up and slice into pinwheels. [Add another "p" while I'm at it.] My slices were a bit squooshy because I again RTFM didn't see Bryn's suggestion to chill the rolled dough for 30 minutes before slicing. Do as I say in the instructions, not as I did. Had I bought a 3rd box of puff pastry I would need to buy a new freezer to store it I'd carefully remove the package of dough from the box, rip the box to shreds so I'm not tempted to be led astray by the instructions on it, and try the pre chilling method before posting. But #AppetizerWeek is here, and I wanted to bring you a rare Thursday pizza recipe so you get this after only 2 tries. I made this pizza using pickled banana peppers which did not grow in my garden. [Oh, there were banana pepper plants, 3 of them, planted in my garden. They produced, over the course of the summer, I think about 5 peppers. Total. Woot.] If you prefer pickled jalapeños they'd also be a good combination with pepperoni--we just had that combo on a regular pizza crust last weekend. If you prefer to avoid pepperoni, tomorrow in my final #AppetizerWeek post I'm sharing a vegetarian puff pastry pizza. It's topped with roasted garlic oil, caramelized onions, spinach, olives, marinated artichokes, and goat cheese. But because today's pizza name is such an alliterative mouthful, I'm calling tomorrow's pizza Very Veggie Puff Pastry Pizza Bites. Bacon Wrapped Smokies with Brown Sugar by What's Cooking, Love? NOTE: This recipe is not gluten free as written, because of the puff pastry I used. To adapt this recipe for a gluten free diet please substitute the gluten free puff pastry dough of your choice. Preheat oven to 400 degrees Fahrenheit. On a lightly floured piece of parchment paper, roll out the puff pastry to a 10 by 15 inch rectangle. 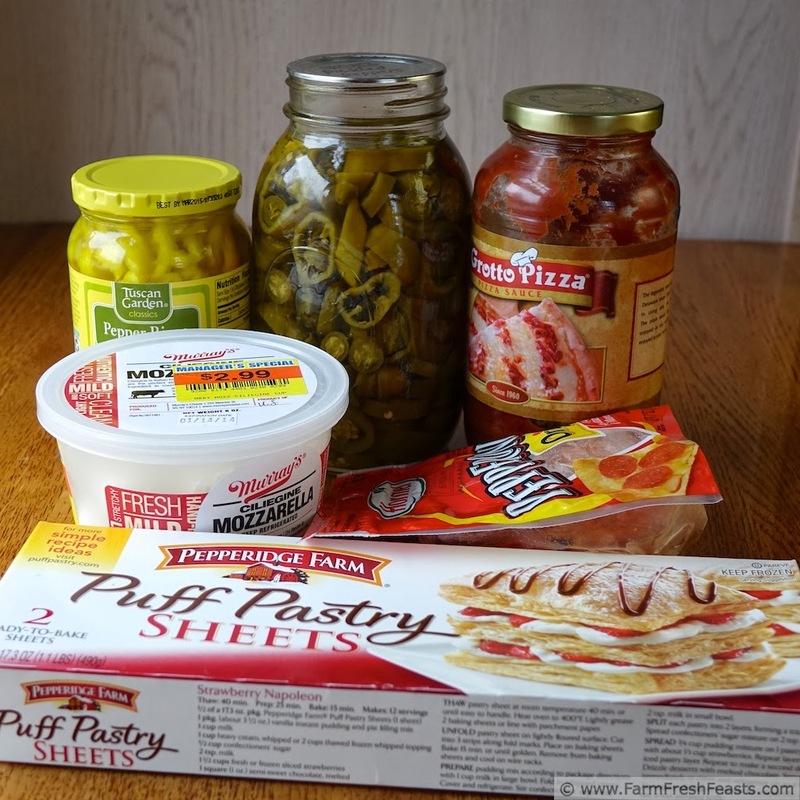 To make pinwheels: spread sauce across dough, leaving 1 inch uncovered along the long (15 inch) side furthest from you. Roll up starting with the long side closest to you and rolling away from you. Chill the dough for 30 minutes, then slice into ½ inch thick slices. I got about 20 I think, but the kids were grabbing them and eating so I didn't get a final count. To make a single large pizza: Spread sauce across the dough to the edge. Add toppings. Bake 15 minutes until the crust is browned and puffed on the edges. Cut into squares to serve as an appetizer. Since I make pizza for my family just about every Friday night, I've been sharing many pizzas on this blog. 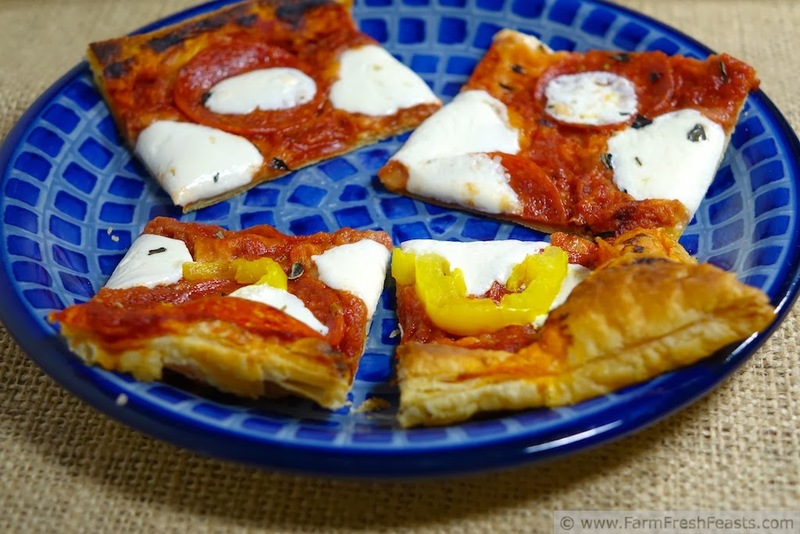 Please refer to my Pizza Primer post for general pizza making at home tips, and please refer to my Visual Pizza Recipe Index for other topping combinations. This recipe is shared with the Clever Chicks Blog Hop,From The Farm Blog Hop, Tasty Tuesdays. WOW, Mike would love that spice block. It is too cool looking. My favorite spice is Rosemary (oops that is an herb) for savory dishes or cinnamon for sweet treats. We love puffed pastry here- usually with snails- yum. I hope you win, he would definitely enjoy it. I'd like to eat snails with you once. 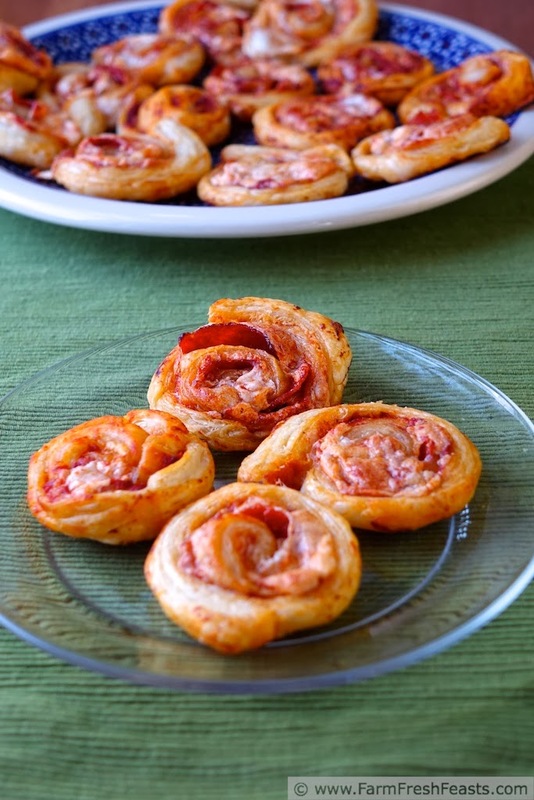 I want tomorrow's Very Veggie Puff Pastry Pinwheel Pizza, but because I'm devilish and love a good story, I enjoyed your tale about today's pinwheels. Sounds like you had a blast and by blast I mean that instruction box is lucky to have made it to the recycling bin in one roughish piece....I'm assuming he did make it to the recycling pin and you didn't tear it apart with your bare hands and then feed it to the pig. I'd never give a box to the pig! An oatmeal tub for a tunnel, sure. I hit the outlet mall yesterday for pears, placemats, and puff pastry and gave the lady working in the Pepperidge Farm shop an earful about my troubles. Then left with 2 packages of sheets and 2 packages of cups for more reindeer games.